As you can see on the wall to the left, we have a wine rack - which isn't really helping our need for storage any (those tiny drawers on top and a basket underneath are the most it has - so not much!). There is also a huge African basket next to it holding home school materials. While functional, it's not that pretty. What you can't see behind where I was standing with the camera when I took this was a bar-height counter that looks into my kitchen. More often than not, it's covered in mail. And library books. And, well, really anything that needs a temporary home. It's not pretty. I had been scouring Craigslist for months looking for either a proper sideboard or a long dresser that we could use as a sideboard. The unfortunate thing is that everything was either too expensive, too long for the wall or it sold too quickly. Through Craigslist, I became aware of a long dresser that was the perfect size and had no hardware AND I could have it for free: I just needed to go pick it up. Score! While I had to pay to rent a truck in order to collect it, I was able to sell the wine rack and break even on the truck rental cost. 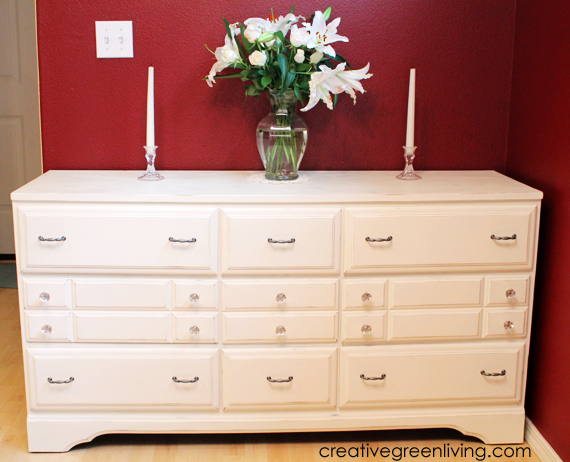 Here is how I transformed this humble curbside rescue into the elegant sideboard currently sitting in my dining room! 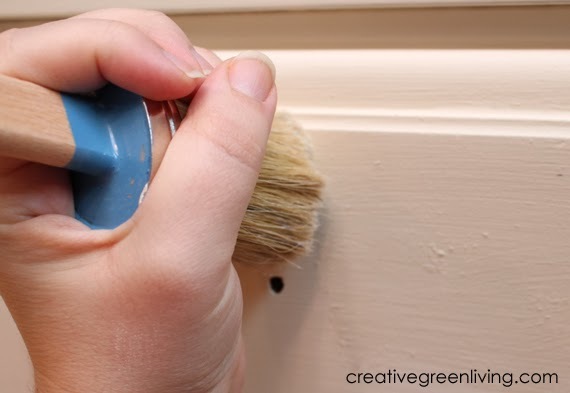 One thing I love about Chalk Paint® is that it requires no prep of the actual surface. You do not need to sand or prime the thing you are painting. The dresser I was working with had been mostly primed in preparation for some kind of makeover from its previous owner but there were some pretty significant un-primed areas that the paint stuck to just fine. 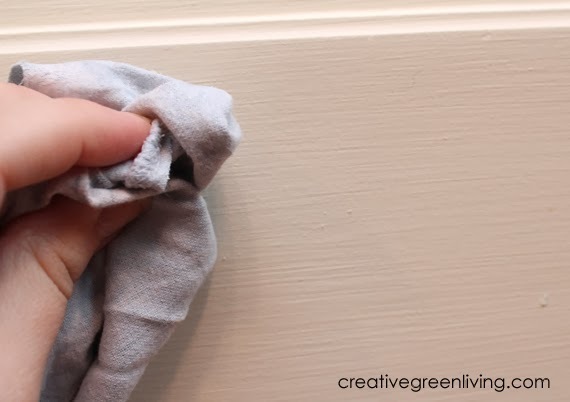 You do, however, want to wipe down your piece with a damp cloth to remove dust. If you are working on a hard floor like I was, you will also want to vacuum or sweep before you start so dust bunnies don't become airborne and lodge in your pretty paint! Also, lay down some paper on the floor and secure it with masking tape. Go ahead and remove the drawers so they can be painted separately. I went ahead and painted the frame, the fronts of the drawers and the sides of the drawers (both the insides and outsides of each). 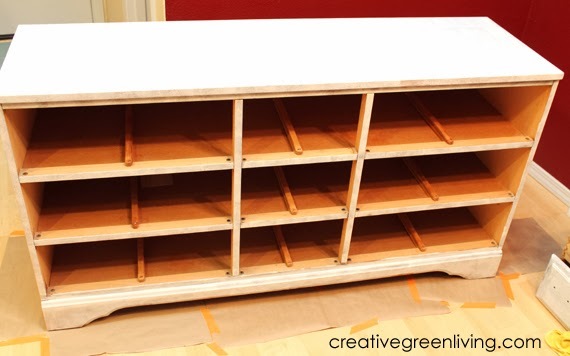 I applied two coats total of Old White to the frame and the drawer fronts. The sides of the drawers just got one coat. The paint dries pretty quickly, so by the time I was done painting the first coat on everything, I was able to go back and do the second coat right away. 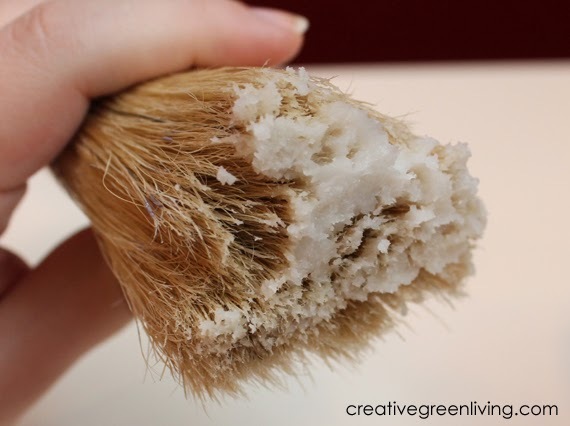 Once you're done applying the Old White, go ahead and rinse your brush until the water runs clear and set it aside to dry. 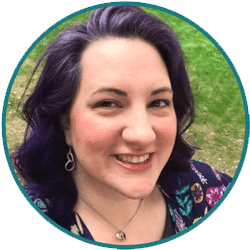 A little about the paint: If you read other blogs or spend any amount of time surfing Pinterest, you have surely heard of Chalk Paint®. And I'm not talking about the knock off chalk paint - the legit stuff from Annie Sloan - and there is a good reason: This paint is awesome! It has a wonderful feel and texture while applying. It is low VOC. It has no odor (I was 5 months pregnant when I painted this and could not smell it at all). It gave my piece a beautiful, historic, rich, expensive look. I cannot emphasize how much I love this stuff! If you want, you can stop here. 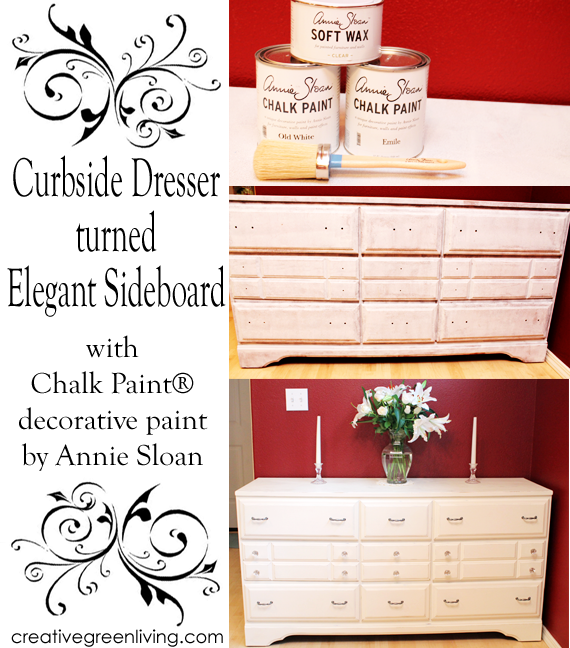 Just giving two coats of the Chalk Paint® to the dresser was enough to make it look like a whole new piece. You could stop painting here and just skip down to Step 4 about wax and call it a day. I, however, had big plans so I kept going. 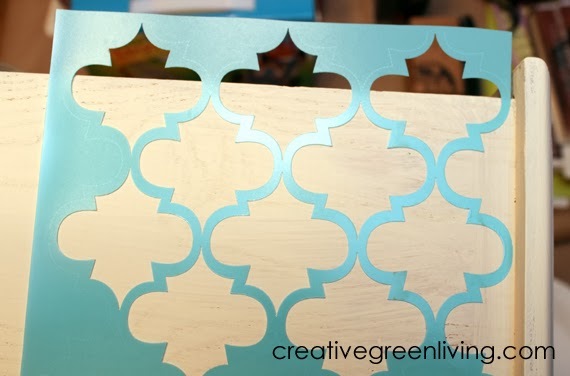 I cut the stencil pattern I liked from the Martha Stewart Arabesque Large Stencil Set . I flipped it over to the back and sprayed it with Stencil Adhesive Spray , following the instructions on the can. Then once it was dry, I positioned it on the side of the drawer I was detailing. Then, I lightly dipped the largest stencil sponge in the top of the can of Emile colored Chalk Paint®. I blotted it off on the paper plate to remove excess and lightly dabbed in up-and-down motions over the stencil. Once the whole stencil had been covered, I removed it and carefully lined it up to do the next section. 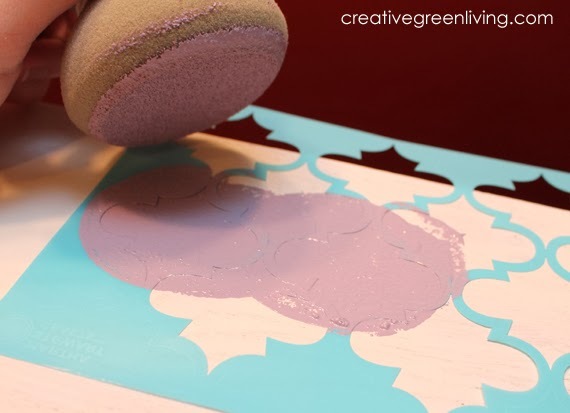 It is important to note that you can successfully move these stencils from side to side but in order to do a second row, you must wait for the top row of stenciled paint to dry. I also used a small foam brush to paint the inside of the drawer lip in Emile as well. I continued painting the drawers I wanted to use the stencil on. 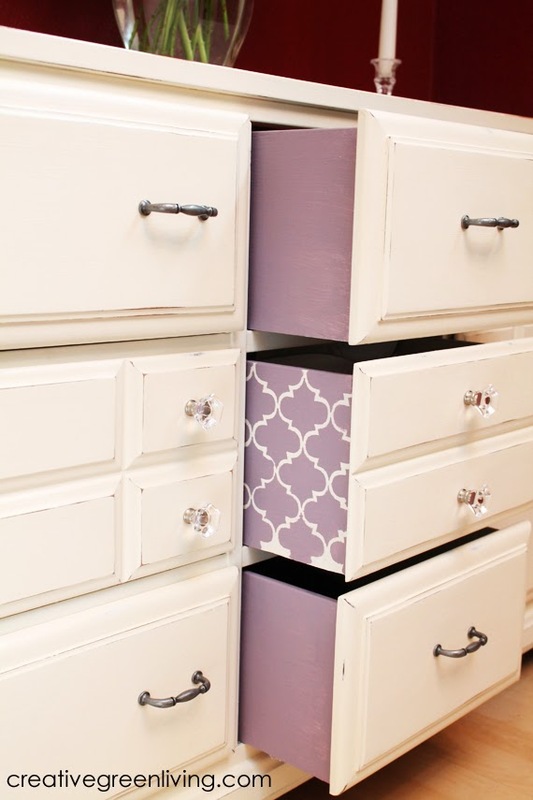 As you can see in my sneak peek picture, I only stenciled some drawers. For the others, I used the Annie Sloan brush to apply one coat of Emile to the sides as well as the inside bottom of the drawer. 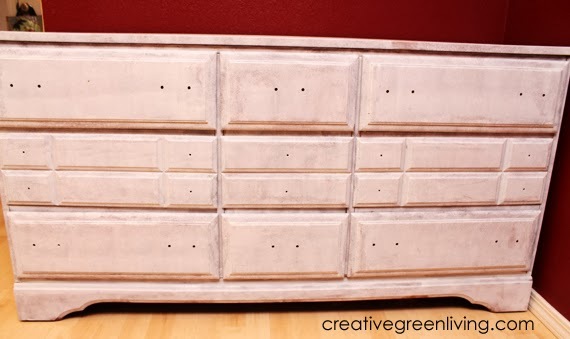 For my nine drawer dresser, I painted 5 drawers with the stencil and 4 with just solid Emile Chalk Paint®. 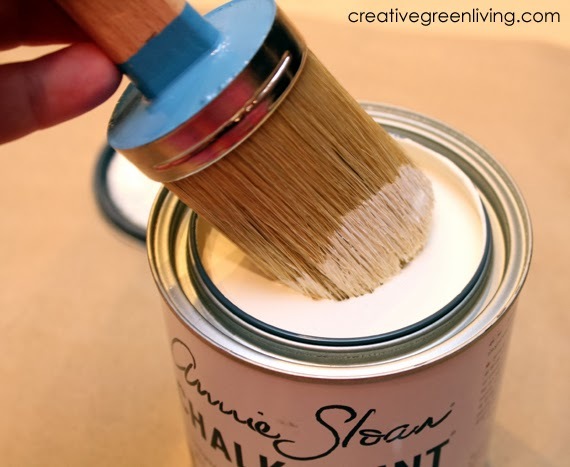 Once your paint has dried completely (overnight or so), you can apply the first coat of Annie Sloan Clear Soft Wax. It is important to note you should not do this if you are pregnant. You should also be sure the room is well ventilated or do it outside if it's not cold. 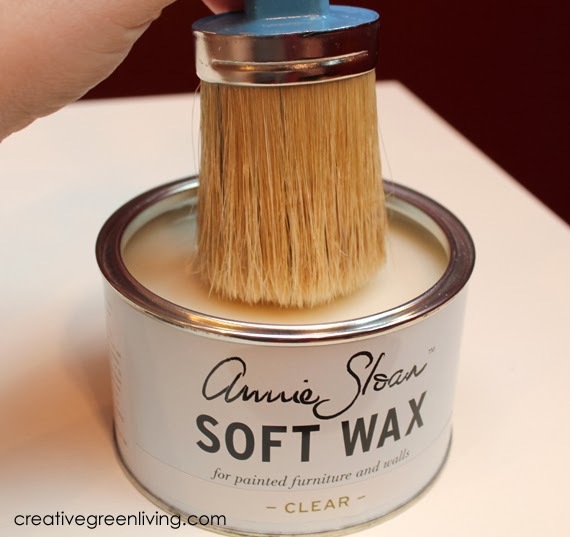 To apply the first coat of wax, dip the clean and dry Annie Sloan brush in the top of the wax. Then, holding the brush firmly around the base of the bristles, start to work the wax into the paint. Once you've done a small area (like a drawer front), use one of your rags to really rub the wax in / remove any excess. There should be no little chunks of wax left - just a subtle sheen. Kind of like applying lotion. I only applied wax to the frame and the drawer fronts. Even though I had painted the insides of the drawers, I left those wax free. Allow the wax to dry for approximately 2 hours before adding another coat of wax or distressing. Like the color pop, distressing is optional. A lot of people use Chalk Paint® to get the distressed shabby chic look - but you can leave it beautifully matte and unmarred as well! In fact, I was so happy with how it looked pre-distressing that I had to think about what I wanted to do for a day or so. 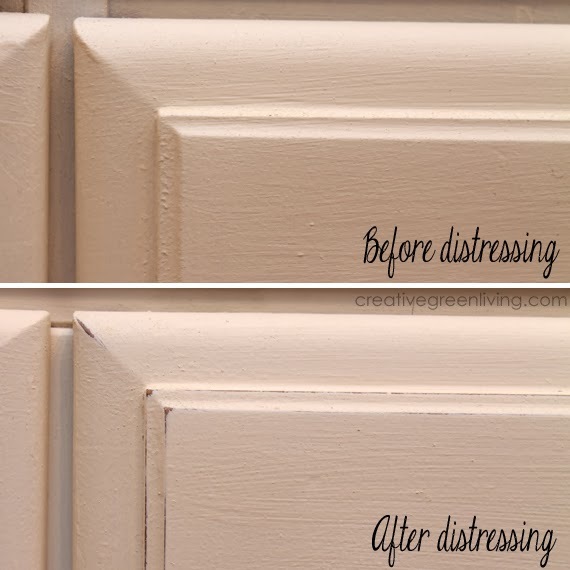 In the end, I picked distressing because it lets my furniture be pre-broken in. I have a three year old boy and another little boy on the way. There is no way a flawless piece of furniture is going to stay that way for long in my house! By doing some distressing now, I am making it easier for any future scratches and dings to blend in instead of stand out. 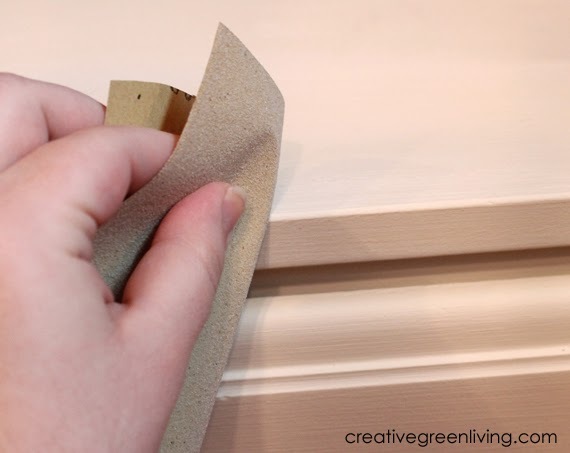 To accomplish this, I used coarse sand paper to remove some paint from the edges of the frame and drawers as well as some random spots throughout. I didn't go too crazy: it's more of a subtle worn-in look than a chippy-chic one. Once you have reached your desired level of distress, use a damp rag (not one you used for wax) to remove any dust from your piece. You will probably need to vacuum the floor again as well. Apply a second coat of wax following the instructions in step 4, being especially carefully to really work the wax into any wood you exposed through sanding. I waited 24 hours for the wax to harden a bit before installing the hardware and drawer pulls. I got the clear acrylic knobs for the center drawers from Home Depot. Because the hole width for the other handles was odd (2.5" instead of 3" which is more standard), I had to special order the other hardware through MyKnobs.com. Although the wax will be dry in just a few hours, it will take approximately 4-6 weeks to cure completely to reach its final, hard, durable finish. In the meantime, you can use your furniture but be gentle with it and try to avoid scratching it or exposing it to liquids. disclaimer: Annie Sloan Unfolded kindly provided the paint, wax and paintbrush I used to transform this piece of furniture. 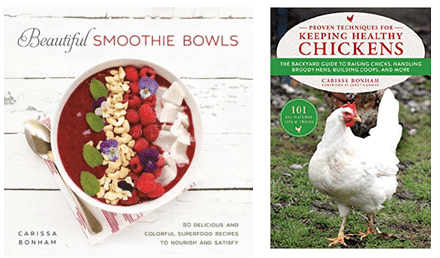 All thoughts and opinions of the Chalk Paint® and other products are entirely my own. This post is not sponsored in any way by Martha Stewart, Home Depot or MyKnobs.com. See my complete review policy here. Beautiful, inside and out. Great tutorial on how to use the paints too! I love the color on the sides of the drawer! So clever. 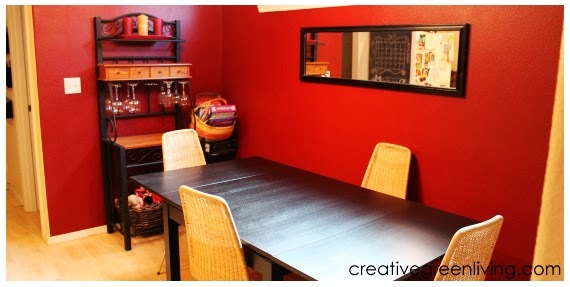 I really need to try chalk paint. It looks great! How gorgeous! I've never applied wax with a brush before - only a rymplecloth. I might have to try this! This is stunning, Carissa! Your tutorial was really helpful, and my favorite part is the unexpected pop of color on the sides of the drawers! What a beautiful project! What a pretty transformation! I love the pop of purple and the pretty stencil! What a fun surprise when you open the drawers! I love it!!! That is SO pretty, and I love what you did with the drawers! Awesome job! !